Bandai's Youtube channel recently released a video on how to transform the Tamashii Web Exclusive S.H. Figuarts Auto Vajin from Battle Mode to bike mode. It was confirmed that there will be two sets of releases, one with the Faiz figure and one without. The sets will be released this May 2014. For the stand alone release of the S.H. 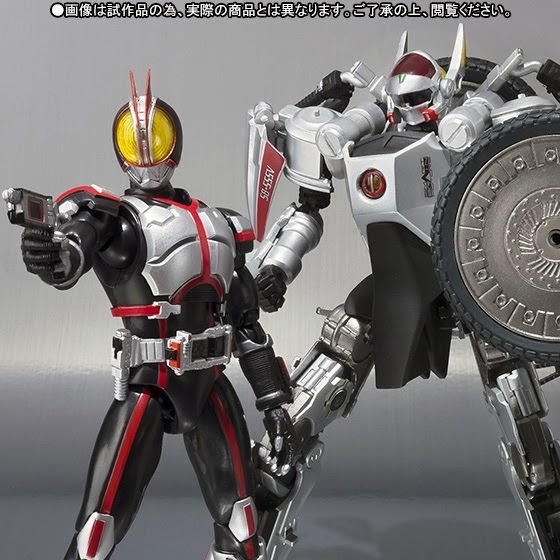 Figuarts Auto Vajin, the figure is about 170mm in battle mode and is inclusive with 2 pairs of extra hands, a Buster Wheel, Faiz-case, a rear wheel stand and a pair of wrist attachments for Kamen Rider Faiz. This is priced at 5,400 yen. The alternative set will include the above-mentioned parts for the Auto Vajin plus Kamen Rider Faiz. Also part of the accessory count are the 2 replacement right wrist, one replacement left wrist, Faiz shot wrist, 2 replacement Faiz driver, Faiz accelerator, 1 Faiz Pointer (kick mode), 1 phone blaster, Faiz-edge and the Faiz-phone and will retail at 8,356 yen.